Take a sip. You'll laugh, you'll swoon, you'll never want this moving Victorian love story to end. 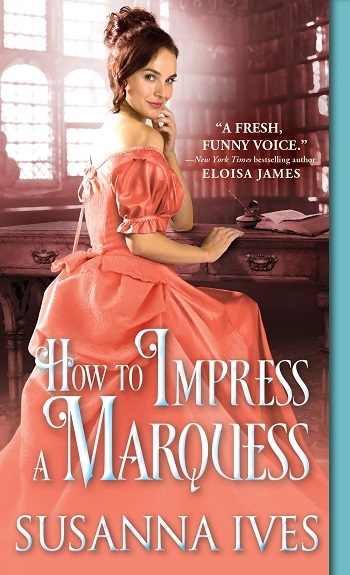 How to Impress a Marquess is the third installment in the Wicked Little Secrets series, so I suggest reading the series in order for maximum enjoyment. However, I'm sure it could be read as a standalone without any major confusion. I feel the need to point out how the blurb gives no hint of the premise whatsoever. The novel features some of historical romance's favorite tropes. The guardian and the ward falling in love. The stuffy alpha male who lives a life by the rules vs the independent-minded, untamed damsel. Reluctant, guilt-inducing lust. Scandal bringing about marriage, where the guardian finds his ward too intriguing to let her go. The ward refusing to abide by any rules. All these tropes are angst-filled and yummy deliciousness. The issue for me, is that combining all those above was a bit too much to handle. In my case, it was an issue of finding Lilith immature rather than independent, silly rather than mature. I had a difficult time falling into the story and finding entertainment when the heroine annoyed me with her behavior. I enjoyed George for the most part, but I found it impossible that George and Lilith could be meant for each other with the wide gap of maturity level, with her behavior and antics (which I'm sure some readers will find refreshing, spitfire, or humor-inducing) of that of a wife. This is on me, with my too serious personality, because once you find one of the main characters frustrating to read, the entertainment value of the novel itself fades. While I enjoyed George, how well this installment fit into the series, and some of the tropes used, I had a difficult time suffering through Lilith's character. Recommended to fans of Historical Romance, Susanna Ives, and the Wicked Little Secrets series. For reviews & more info, check out our Wicked My Love post. Reviewers on the Wicked Reads Review Team were provided a free copy of How to Impress a Marquess (Wicked Little Secrets #3) by Susanna Ives to read and review.